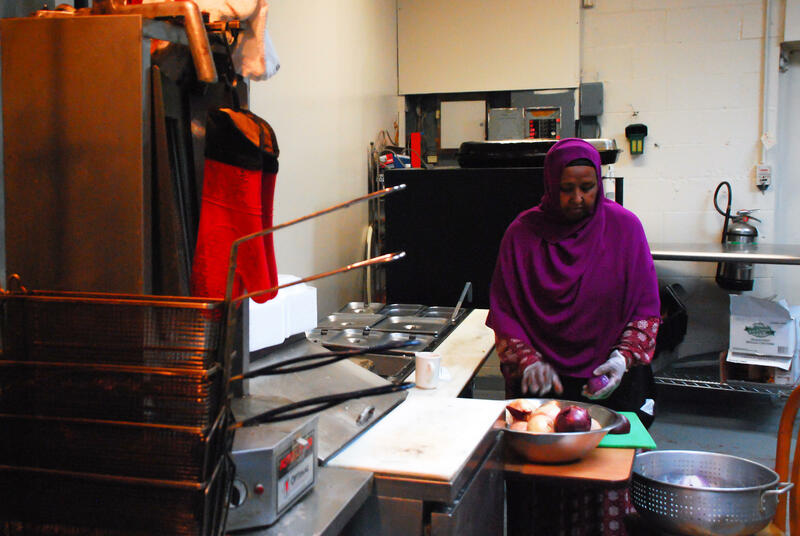 Abdilahi Hassan is the owner of Hoyo's Kitchen, a North Side restaurant that serves "fast casual" Somali food. At Hoyo's Kitchen, Angie Sharkey says she likes a little of everything. Sharkey, who came with two colleagues from the Columbus Metropolitan Library, says they're regulars here. When owner Abdilahi Hassan comes around to take her order, she tells him, "Surprise me." 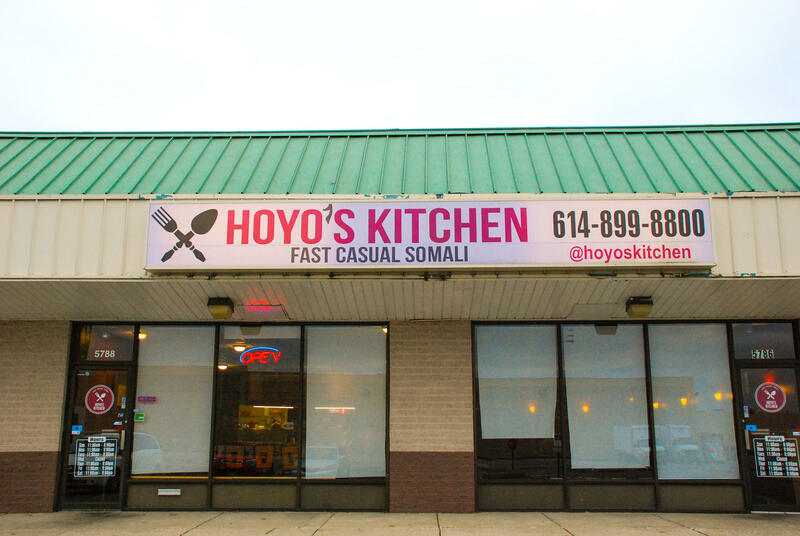 Tucked into a nondescript Cleveland Avenue strip mall, between an Irish pub and "Waterbeds and Stuff," Hoyo's Kitchen has the curious honor of being the city's only "fast casual" Somali restaurant. In the three years since it opened, though, Hoyo's already earned a devoted following in Columbus – and expanded a lot of appetites. The food website Eater recently called Hoyo's one of the "Midwest's 38 Essential Restaurants." It was the only Columbus establishment to even make the list. Over the past decade and a half, tens of thousands of Somali refugees settled in Columbus, mostly on the city's North Side. Hassan, 29, is one of them, after moving with his family to Columbus from the D.C. area 14 years ago. But food's always been on his mind. Hoyo's Kitchen was named one of the 38 essential restaurants of the Midwest by the food website Eater. “I love my mother’s cooking," Hassan says. "I grew up basically hyping my mom up. Every time she would make something different, I’d be like, 'Yeah, if only you’d open up a restaurant, people would be flocking.'" After graduating from Ohio State in 2014, Hassan convinced his mother to open a restaurant with him. Quickly, it became a family endeavor. "Everyone from my nieces and nephews to my grandparents jumped into the kitchen when we really need them," Hassan says. “From the very beginning, this was an homage to my mother’s kitchen." "Hoyo," Hassan explains, means "mother" in Somali. Just after the lunch rush, Hassan's mother Hayat Dalmar, 56, is back in the kitchen. She pulls from the oven a large pot of rice, bright orange from the spices. “I brought my kitchen from my house to this restaurant," Dalmar says, laughing. Hayat Dalmar, 56, is the mother of restaurant owner Abdilahi Hassan and the head cook of Hoyo's Kitchen. Of all her dishes – goat, chicken, chai – she says rice is by far her favorite to cook. Columbus' North Side hosts a number of Somali restaurants, including Calanley, Durbo's, and Kulmiya. And that's not including Ghanian restaurants like Drelyse and Kenyan restaurants like Wycliffs' Kitchen. But Hassan says certain aspects of African cuisine still seem "exotic" to Americans. Goat, especially. But a lot of Somali food might be more familiar than people think. Hassan explains Somali food is an "organic fusion," combining flavors from Indian, Middle Eastern and East African cuisines. Dishes like chabatti, a flat bread, or ugali, a sort of corn porridge, have versions all over the world. Hoyo's Kitchen serves a Somali chai tea, flavored with cardamom, cloves, cinnamon and nutmeg, spicier than the kind served in most coffee shops. 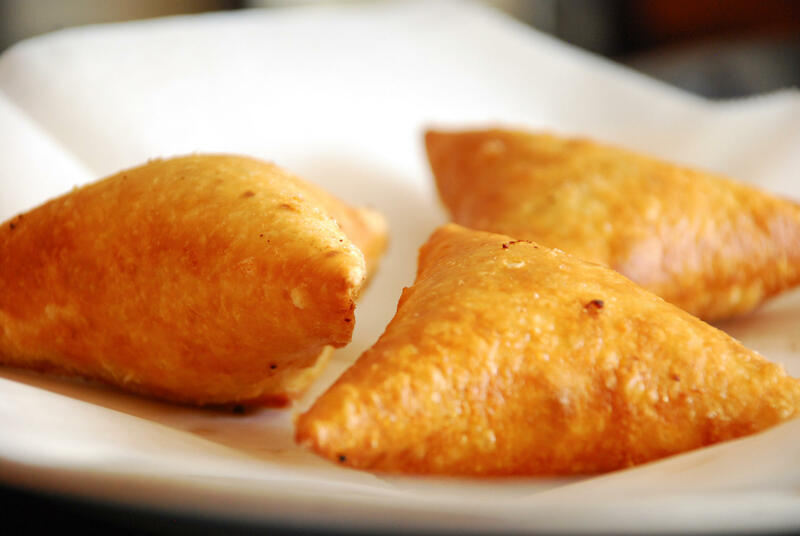 And they're well-known for their sambusas, the Somali version of an Indian samosa: fried and triangular-shaped pastries. The main difference between sambusas and samosas, Hassan says, is beef. Hassan says Sambusas, the Somali version of the Indian samosa, are the "gateway to Somali food." Around Columbus, Hassan has graduated from hyping his mother's food to hyping Somali food in general. He wants Hoyo's Kitchen to be a sort of ambassador, which is also why he embraced the label of "fast casual." Columbus boasts a glut of "fast casual" restaurants, which split the difference between fast food and casual dining. Chipotle is the most famous, but Columbus has plenty of local "fast casual" chains like Fusian, 6-1-Pho and Bibibop. By breaking down Somali dishes into parts, Hassan hopes to make it more approachable – for white people, for African-Americans, and just for everyone who hasn't encountered this particular cuisine. They've made headway on that part, something Hassan credits to Columbus Food Adventures, which brings a tour by every Friday night. Hassan, though, has big ideas for what Hoyo's Kitchen could be. "We want to be the bridge between our Somali community and the larger American population," Hassan says. Editor's Note: A previous version of this story left out mentions of other Somali and African restaurants in Columbus. Since a bombing killed 358 people in the Somali capital of Mogadishu October 14, members of Columbus' Somali community have been working to deliver aid. Local fundraising efforts over the last five days raised more than $13,000. Columbus has the second-largest concentration of Somali immigrants in the U.S., following Minneapolis, which has almost double the population. Stefanie Chambers, who compared the two in her book "Somalis in the Twin Cities and Columbus," says Columbus still lags behind in incorporating Somali-Americans into the community. At a large banquet hall on the Ohio State campus, women wear dresses and headscarves of light blue and white - the colors of the Somali flag. People dance to a hit song written just for the occasion: the election of Somalia's new president, Mohamed Abdullahi Mohamed. Sitting within an unassuming strip mall in north Columbus, Mardi Gras looks like just another ice cream store. Inside, the chilled glass countertop is filled with the typical flavors - mint chocolate chip, butter pecan and strawberry ice cream. Turn to the adjacent wall, though, and you’ll see a large white board listing dozens of flavors found nowhere else - like kesar pista (a blend of saffron, cardamom and pistachio) or chickoo (a sweet tropical fruit originally found in Central America).